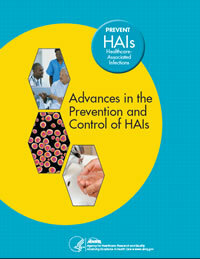 This report presents methodological insights from projects in AHRQ’s Healthcare-Associated Infections (HAI) Program. The individual papers presented here were prepared by AHRQ-funded HAI project leaders. The 19 papers included in the report are divided into two sections: Development and Implementation of HAI Prevention Practices (11 papers) and HAI Risk Identification for Quality Improvement (eight papers). Prepared for: Agency for Healthcare Research and Quality, Rockville, MD, under Contract HHSA290200710071T. Peter J. Pronovost, Jill A. Marsteller, Albert W. Wu, et al. Barbara I. Braun, Loreen Herwaldt, Marin Schweizer, et al. Michael A. Rubin, Makoto Jones, Jefrey L. Huntington, et al. Amy Irwin, Susan L. Moore, Connie S. Price, et al. Sheryl Zimmerman, C. Madeline Mitchell, Anna Song Beeber, et al. Jon Mark Hirshon, Angela C. Comer, Joseph H. Rosenberg, et al. Carol VanDeusen Lukas, Elisa Koppelman, Belinda Ostrowsky, et al. Heidi Wald, Angela Richard, Brian Bandle, et al. Katelin B. Nickel, Anna E. Wallace, David K. Warren, et al. Marc B. Rosenman, Kinga A. Szucs, S. Maria E. Finnell, et al. Donna M. Schora, Susan Boehm, Sanchita Das, et al. Elias Brandt, Douglas H. Fernald, Bennett Parnes, et al. Lucy A. Savitz, Susan L. Moore, Walter Biffl, et al. This publication was prepared for the Agency for Healthcare Research and Quality (AHRQ) by IMPAQ International, LLC, Columbia, MD, and RAND Corporation, Santa Monica, CA, under contract no. HHSA290200710071T. The opinions presented herein are those of the authors and do not necessarily reflect the position of AHRQ or the U.S. Department of Health and Human Services. This document is in the public domain and may be used and reprinted without permission. Citation as to source is appreciated.